Recent studies have shown that the lack of integration between sales and marketing systems can cause the biggest gap between top sales performers and under-achievers. 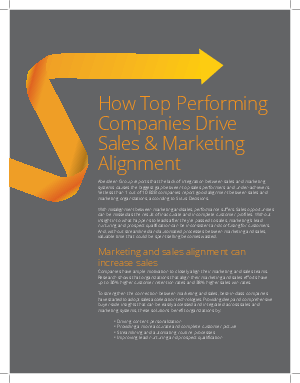 Yet less than 1 out of 10 B2B companies report good alignment between sales and marketing organizations, according to Sirius Decisions. Download the white paper “How Top Performing Companies Drive Sales and Marketing Alignment” to learn more about how content personalization, analytics, and process automation can help you build a stronger relationship between sales and marketing.